Photo: Courtesy of Green Hopping. Once upon a time, juice cleanses came to New York — and, well, they just never left. Even if you're not the type to commit to a full-on cleanse, you've probably got a deli near your apartment that does a killer carrot-orange-beet-what-have-you. But, what are you supposed to do when you're in an unfamiliar neighborhood and have a hankering for some puréed kale (#firstworldproblems)? Now, as expected, there's an app for that. Enter: GreenHoppingNYC. 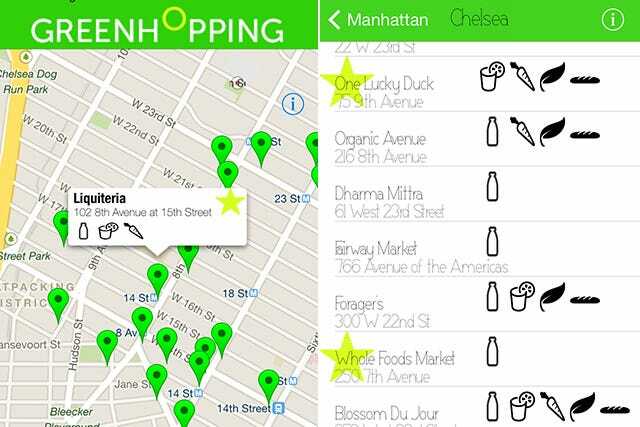 The app catalogs all the green juice bars around the city and categorizes each location based on its offerings. For example, you can search by bottled or freshly-pressed juices, smoothies, vegan or raw options, and gluten-free food. There's also a "Tip Of The Day" section, where you can learn about different fruits and vegetables or simply glean a few healthy-eating facts. Catherine Cuello, 25, created the app after her own health scare caused her to adopt a raw diet. Her goal, she says, is to "make healthy eating trendy." But, thanks to the likes of goop, well-balanced diets are already all the craze — especially in cities like L.A. and NYC. However, an app like GreenHoppingNYC does make finding wholesome, organic food while on the run a more accessible and realistic option. You can get the app directly from the iTunes store and the first 250 downloads are free. If you miss the boat on that deal, it's still just $0.99 to purchase. This feels especially affordable in contrast to the price of all the cold-pressed green juices you'll be scoping out.